just moved to San Diego, CA. We are an Organic, Vegan and Raw Food Culinary Institute, Delicious Healthy Catering & Healthy Lifestyle Retreat Service and an Optimum Health Information Hot Spot. We offer Healthy Food Preparation Classes, an Advanced Vegan and Raw Food Chef Certification Course, Healthy Lifestyle Retreats, Juice and Raw Food Cleansing Programs, Integral Hatha Yoga, Prenatal & Postpartum Yoga and more. We are on hold with classes at this time. The owner/operator has recently moved to San Diego and hasn't decided if the business will go full force in San Diego yet. In the meantime she is enjoying precious moments with her new baby girl and is teaching occasionally at UCSD's Centers for Integrative Health though their Cooking and Healing Program. She shares her knowledge about the amazing healing benefits of whole plant foods and how to prepare them with doctors, patients, medical students and the general public. Please get in touch if you would like info on UCSD classes, have any other questions or would like to be informed when classes start back up. The demand for gourmet healthy vegan and raw food availability is growing around the world. Body Temple Gourmet Culinary Institute offers flexible, comprehensive programs designed for the professional chef or restaurant owner to keep up with the rising tide of healthy delicious food service, entrepreneurs endeavoring after a new exciting professional life, or individuals interested in incorporating a bit more delicious health into their families and personal lives. Whether you are a beginner or already a professional gourmet chef, you will efficiently gain the experience needed to confidently and successfully add simple and gourmet vegan and raw foods to the menu. 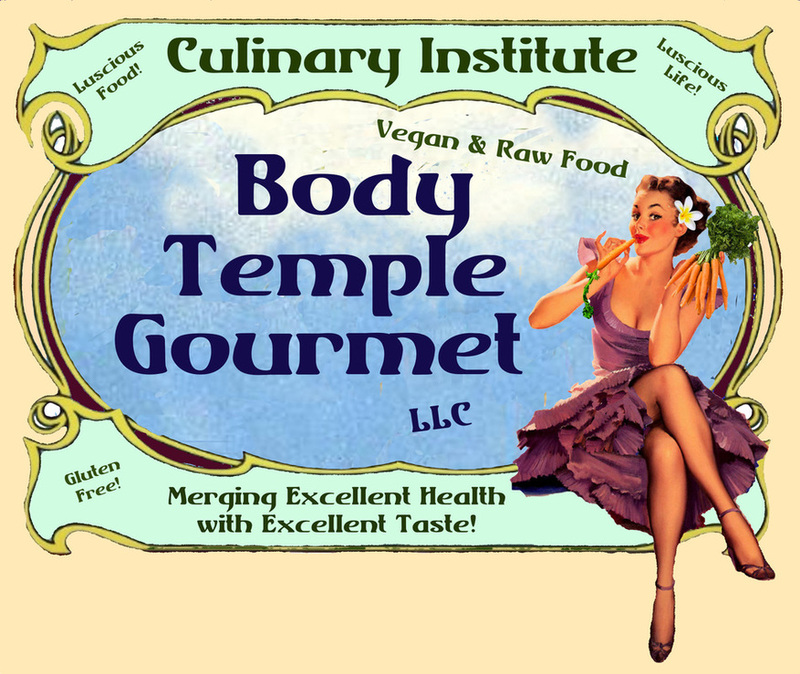 At Body Temple Gourmet, we combine Excellent Taste with Excellent Health and make Healthy Living Easy, Delicious and Fun! Healthy Lifestyle Yoga Retreat Opportunity - a unique hands-on healthy lifestyle practice... Join us for one day or longer immersions and easily gain the body knowledge and awareness to take your health to the next level. Daily hands-on practice with culinary education, yoga & exercises, optimum health information study, and fun. Join us for a cleanse, combining organic raw foods, juice & smoothie feasts and intermittent fasting. Everything Body Temple Gourmet does is based on a high standard of excellence! Website Coupon: For a limited time, bring a friend and you both get $75 off of any Course! -Advance in Health with a Healthy Lifestyle Retreat - 1 day to 2 weeks live in experience - price depends on length of stay ($85-$150/day) includes all meals, elixirs and yoga. For really busy people, we can also bring the immersion experience directly to your home (if you live in San Diego). Occasionally we host adventure retreats out in nature, hot springs, and other natural beautiful healing places. Six Star Testimonial from 10 year Five Star / Five Diamond Chef! In this four day introductory course, you will discover the magic of creating delicious organic vegan and raw food cuisine for optimum health. Vegan and Raw Food Preparation Basics offers the unique opportunity to work with one of the world's most outstanding vegan and raw food chefs. Culinary presentations will show you how to create delicious, easy-to-prepare, vegan and raw food. You will sample fabulous freshly made taste sensations, including soups, sauces, salads and salad dressings, raw tacos, wraps and spring rolls, some holiday favorites, nut milks, nondairy cheeses, crispy crackers, probiotic rich foods, green smoothies, and amazing desserts. You will learn how to balance textures and flavors. Even if you are a 5 star professional chef, you will encounter a whole new world of food preparation skills that are specific to vegan and raw cuisine. Vegan and Raw Food Preparation Basics is your first step toward a new healthy lifestyle! This course is available in San Diego, CA and is a prerequisite for the Advanced Vegan and Raw Living Food Chef Certification Course. Additional Information: This class is observation only—not a hands-on course. Generous samples of organic vegan and raw foods will be provided. Tuition includes materials and ingredients. You will receive a discount for this class if you register for the Advanced Vegan and Raw Living Food Chef Certification Course. This 2 day introductory course will guide you in knowledge and understanding of not only the health attributes of raw desserts but the "how to" of creating amazing tasty delights. Sweet and informative culinary presentations will show you everything you need to know to create incredible, easy-to-prepare, divine desserts. You will sample these wonderful treats throughout the day; a savory lunch will also be served. You will learn how to balance textures and flavors. Even if you are a 5 star professional chef, you will encounter a whole new world of dessert preparation skills that are specific to vegan and raw desserts. Divine Desserts is your ticket to becoming an artist in culinary confections. Probiotics and fermented foods are known to boost the immune system and help to create an environment of health and vitality within your body. 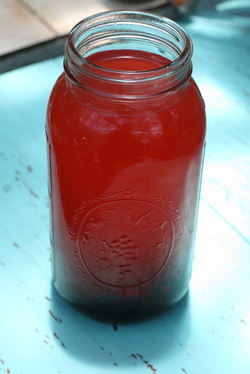 This class focusses on how to make home made rejuvelac, kombucha, sauerkraut, kim chee, pickled veggies, yogurt, kefir, and other probiotic rich foods that boost vitality. Are superfoods really super?... You will learn what superfoods are and how to incorporate them into your daily life and children's lives. In this class you will gain confidence in this tricky and daunting culinary technique. 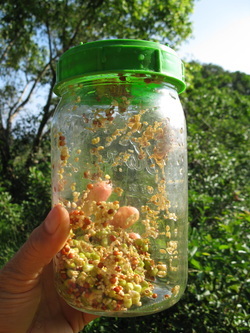 You will be able to taste probiotic rich foods and learn to trust your palate. Probiotic rich foods add a unique flavor to your meals that balances the palate - probiotic foods are delicious - and incredibly nutritious! This class is appropriate for the seasoned 5 star professional chef who wants to incorporate menu options for vegans and raw foodies as well as the at home cook. In this one day informative and fun course, you will discover the magic and ease of growing delicious organic greens on your countertop for optimum health. Growing your own sprouts and microgreens offers the unique opportunity to eat some of the freshest and most nutrient dense organic food on the planet. Whether you are battling a health challenge or just want to boost your vitality, this class will give you the knowledge you need to incorporate daily doses of nutrient dense cleansing food into your meals. Cleansing the body is truly important for optimum health, especially in this day and age where there are so many hidden toxins and chemicals in the foods we eat and air we breathe. Even if we choose organic foods as much as possible and live an organic vegan lifestyle it really helps the body to give it a rest and let nature take over to do some healing. There are many types of cleanses. In this workshop we focus on the cleanses that you can do while living your normal busy lifestyle; we will also learn about a couple deeper cleanses and the herbs associated with deep cleansing each organ of the body. You will learn how each organ of the body works; what it’s functions are, and the herbs associated with revitalizing each individual organ. Healthy delicious nutrient rich elixir and lunch provided. Colonics... good or bad? Water fasting... good or bad? 3month course (1-3 days a week on site plus at home study) $4888 includes materials, ingredients at Body Temple Gourmet kitchen site and discounts on kitchen equipment and supplies. Body Temple Gourmet Chef Certification is based on a high standard of excellence and is highly regarded around the globe. Whether you are a professional 5 star chef looking to expand your skills and keep up with the changing tide of health conscious consumers or just want to get to the next level in your own, or your families, personal health, this course is designed to assist you in achieving a high level of kitchen competence. We provide a supportive hands-on environment for students to learn about vegan and raw food preparation from basic to gourmet. This three month course develops confidence in chef skills and trust in your own personal palate. Upgrading your favorite recipes into healthier ones will be a snap after this course. This advanced certification also teaches students how to give effective culinary presentations and organize food preparation classes. 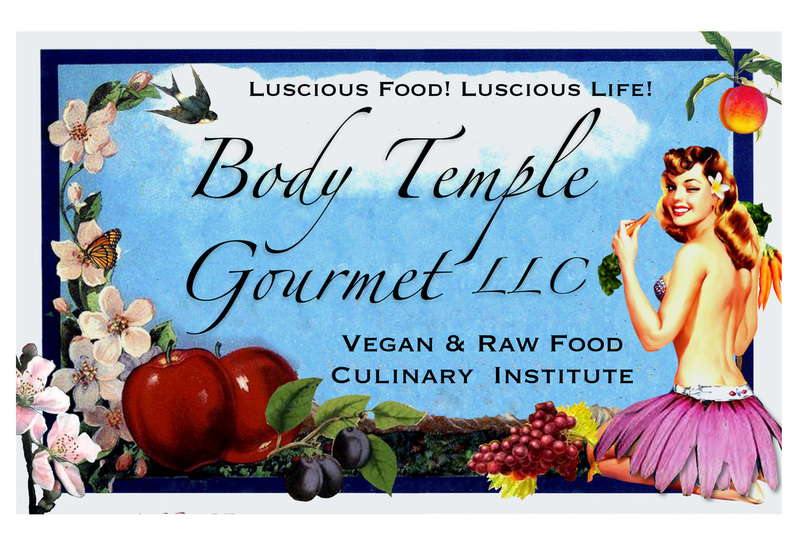 Under the guidance of Body Temple Gourmet anyone with the desire can become a confident vegan and raw food chef as well as an awesome food preparation instructor! After immersing in this course you can create a new career for yourself as a Private Chef, Restaurant Chef or Owner, Vegan and Raw Food Instructor, Spa or Retreat Chef, Event Caterer, and more! “The chef is more important than the doctor” - Franc Ribochaud. Taking the time now in life to learn the importance and daily how-to of healthy food preparation will save heart ache in the future from disease and loss of health. Support your families future and feel 100% great about the food you are serving others, knowing that with every bite they are being nourished not with just their taste buds, but with nutrient rich antioxidants, vitamins, minerals and phytonutrients. Excellent Health married to Excellent Taste - you don’t have to choose one or the other, you can have both! Set yourself up for success with a Healthy Lifestyle Yoga Retreat. Share a room in our house or enjoy Luxury Camping. Advance in your own personal health and change your life for REAL. You’ll have access to the on site library and opportunities to participate in yoga classes and nature hikes. We are family friendly with child care available so parents can take the relaxing time they need to detox and heal. Gently ease into a cleanse starting with delicious vegan meals, move into amazing raw food meals, then on to liquids and healing herbs as long as you feel comfortable, break the cleanse with raw foods and learn how to sustain a healthy high raw vegan diet. The value of this offering is immeasurable. We at Body Temple Gourmet want to make health information and immersion opportunities accessible. We believe that a live in immersion experience is the easiest and most effective way to create lasting change in peoples lives. Sustainability with the earth is synonymous with living in optimum personal health and vitality... it is amazing that when we truly take care of ourselves, we are actually taking care of the earth and all it’s inhabitants as well as promising our children a beautiful future; what a beautiful symbiosis. This amazing opportunity is available in San Diego, CA. We can bring the healthy lifestyle immersion to your home if you are in close enough proximity for commute. For more information on this Healthy Lifestyle Immersion Opportunity, please call Heather (808)250-6578.